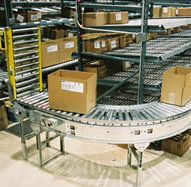 The basic function of a conveyor is to carry or transport cases and totes to different parts of the warehouse. How fast the item travels, if it can be accumulated on the conveyor, and how much it costs to power the conveyor are all key differences used to decide which conveyor type should be used. Automotion has (5) conveyor class types each unique in its features and capabilities. Whether you need the energy efficiency of the AutoRoll motor driven roller conveyor or the simplicity of a gravity conveyor, Automotion's customer service representatives can help you match the right technology with the right application. Automotion's AutoRoll motor driven roller (MDR) conveyor is quiet, safe, low maintenance and offers non-contact zero pressure accumulation. 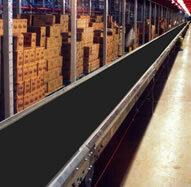 AutoRoll conveyor features "run-on-demand" zones, reducing energy consumption and noise. 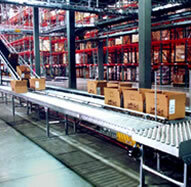 Automotion's motorized roller conveyor line is the most complete in the industry. It is available in several pre-configured modular conveyor figures, including straights, curves, inclines, declines, merges, diverts, and transfers. Our bi-directional heavy-duty transfer alone is one of the best performing mdr transfers available. 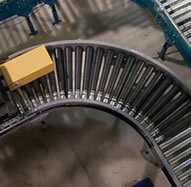 AutoRoll conveyor can also be equipped with one of (2) control options: Itoh-Denki or Insight Automation. Quiet, energy efficient, safe operation. Turns itself off when no cartons are present. Designed to handle cartons and totes up to 75 pounds in weight. PLC control with accumulation logic in the control card. Network control available. Extensive list of pre-engineered figures: straights, inclines/declines, curves, merges, diverts, transfers and sort stations. Automotion designs, manufactures and distributes 4 types of live roller modular conveyor: Adjustable Pressure (AP), Photo Eye Accumulation (PE), Singulation Air (SA), and Transportation Air (TA). Zero pressure accumulation is accomplished using the live roller Photo Eye accumulation and the Singulation Air conveyor. Adjustable Pressue and Transportation Air provide transportation on live roller options. Four available product types: (AP) Adjustable Pressure, (TA) Transportation Air, (SA) Singulation Air, and (PE) Photo Eye Accumulation. Pressure roller drive (AP) and air-activated lifter roller drive (TA) provide a transportation only option. Available in 2", 3", and 4" roller centers. 100 lb/ft live load capacity, 8" wide flat belt drive. The v-belt conveyor also has a number of features, like the specially designed snub driveshafts, that ensure your conveyor system is easy to install and maintain. Press-on plastic tapered shells result in a true light-weight tapered roller. "Quick" belt changes are possible with specially designed drive and terminal ends. Available in standard or "tite-pack" roller centers. Live load capacity of 100 lbs. / ft. List of pre-engineered figures includes: entry and exit terminal ends, intermediate beds, drive and slave-drive ends. 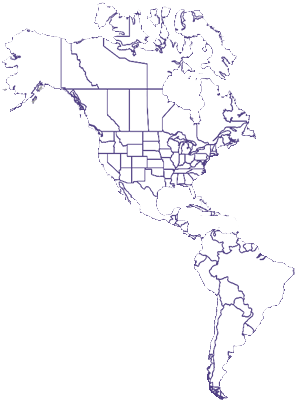 Figures can be configured to create straights, curves, and sweeps. 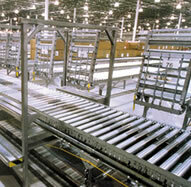 Automotion manufactures two types of belt conveyor: roller bed and slider bed. The slider bed is a typical full-pan construction while the roller bed uses a a hidden roller configuration to prevent product from getting caught between rollers. 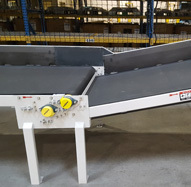 Belt conveyor is available in a wide variety of pre-configured figures including: entry, intermediate, and exit conveyor beds, drive and belt take- up beds, and power feeder and nose over beds. Available in a slider or roller bed design. Slider bed is a typical full-pan construction. Roller bed uses a hidden roller configuration to prevent product from getting caught between rollers. All terminal ends, drives, supports, guard rail, and belting are interchangeable between (SB) slider bed and (RB) roller belt models. Widths of 18", 24", 30" and 36" are standard; 42" and 48" widths are options. Live load capacity of 130 lbs. / ft.
Automatic belt take-up is standard. List of pre-engineered figures include: entry, intermediate, and exit beds, drive and belt take-up beds, and power feeder and nose-over beds. Automotion's pre-engineered gravity roller conveyor is an economical, durable, and safe solution to move your light to medium duty loads. The roller spacing is strategically designed to transport a wide range of products including rigid, soft, and even fragile. Our gravity roller conveyor is ideal for the loading and unloading areas of shipping or receiving and station-to station locations. Roller gravity conveyor is available in standard or light duty..
Standard duty is composed of a 3-1/2" deep 10 ga. frame with 1-7/8" rollers with a 7/16" hex axle. Has a 100 lb. / ft. live load capacity. Light duty has a 2-1/2' deep 12 ga. frame with 1 3/8" rollers and a 1/4" round axle. Available in 18" or 24" widths only. Rated at a 50 lb. / ft. live load capacity. List of pre-engineered figures include: straights, curves, sweeps, and air-brake beds. 7 ga. drive unit housings allow efficient, lower cost manufacturing, provides high precision, and enable them to be self-squaring.